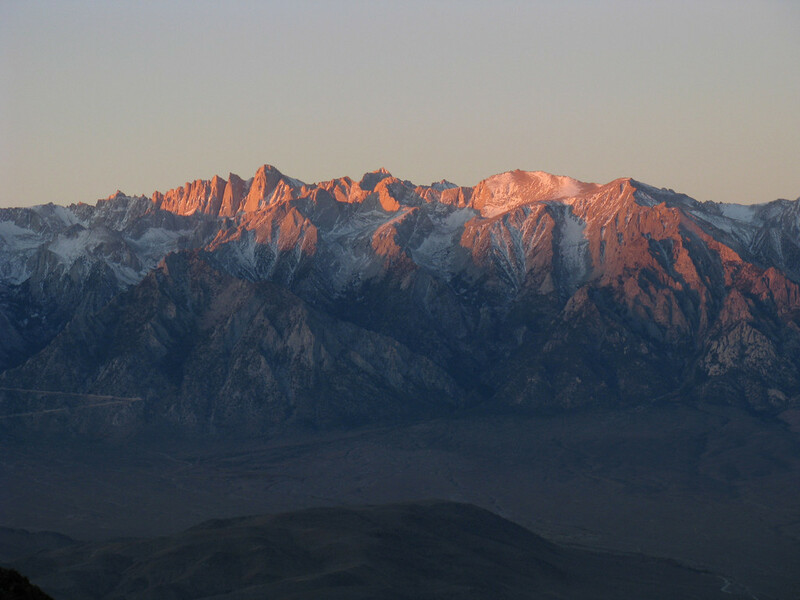 The eastern escarpment of the Sierra Nevada is an impressive geological feature, rising from the desert floor of Owens Valley around 4500′ feet in elevation all the way up to granite spires towering some 10,000 feet above at elevations exceeding 14,000′ feet in spots. 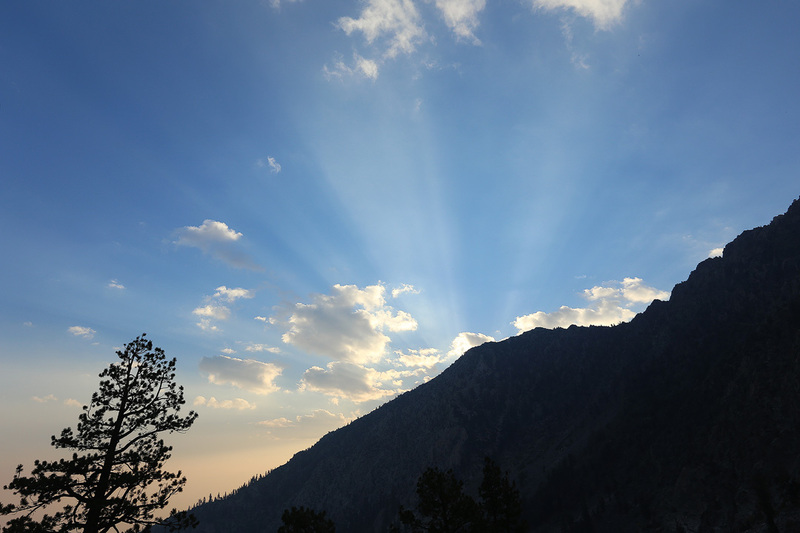 Today, most of the trail heads are reached on paved roads that climb into the mountains some distance, giving the hiker an advantage of starting their trip at anywhere between 7000′ and 10,000′ feet in elevation. 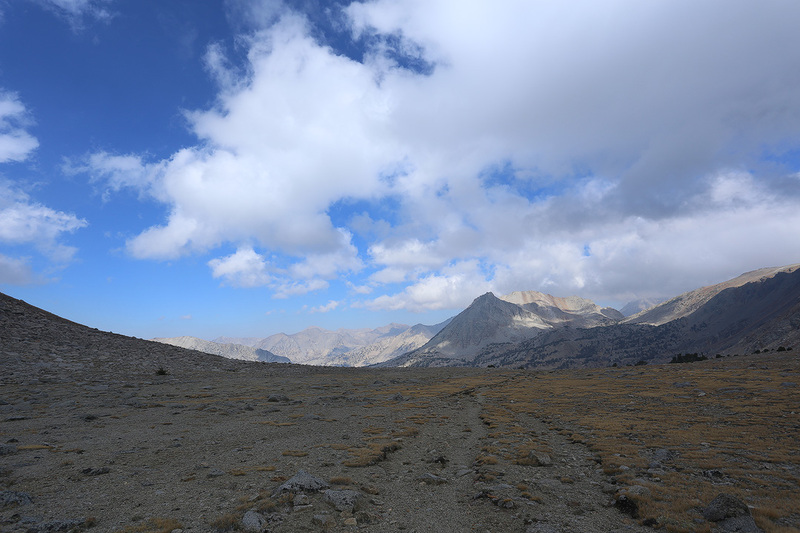 However, there are still a handful of trails that start all the way down on the hot, parched desert floor, before climbing up and over the Sierra crest at what’s called one of the High Passes. 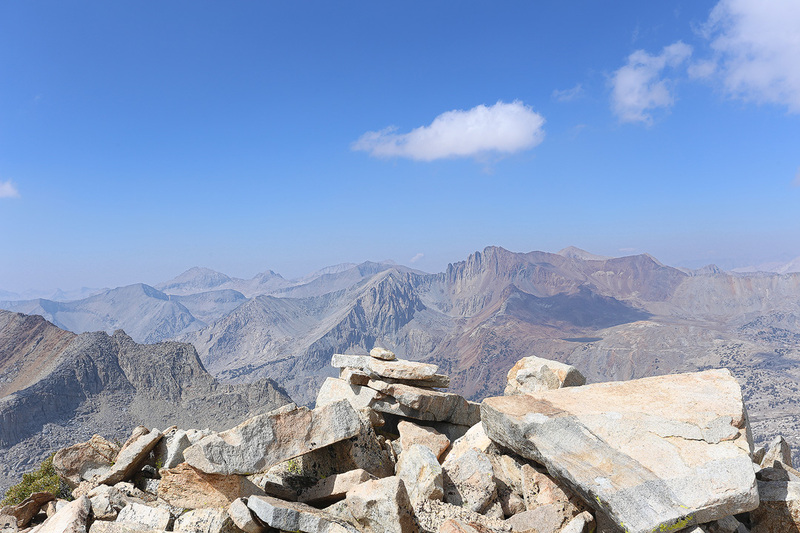 Four notable such trails are the Shepherd’s Pass Trail, Taboose Pass Trail, Baxter Pass Trail and Sawmill Pass Trail. 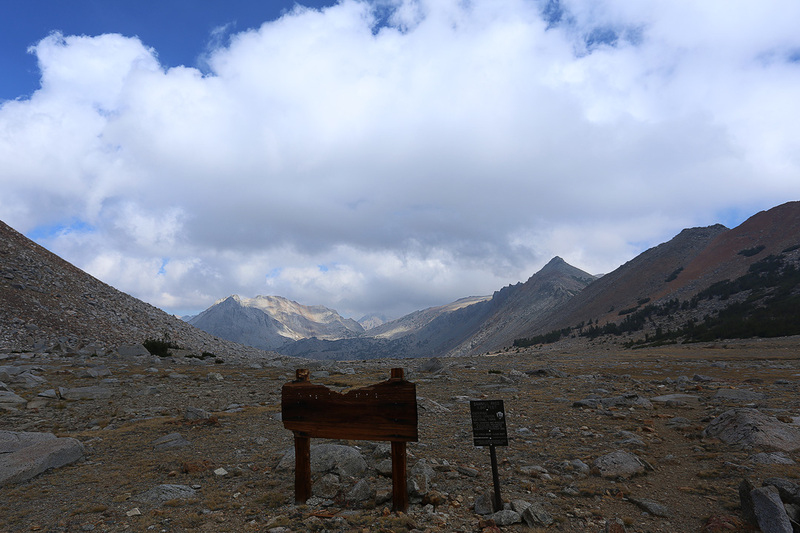 I’ve always wanted to get over each of these passes and my goal for this trip was to climb Colosseum Mountain via the Sawmill Pass Trail – a trip of around 24 miles and roughly 8500′ of gain. 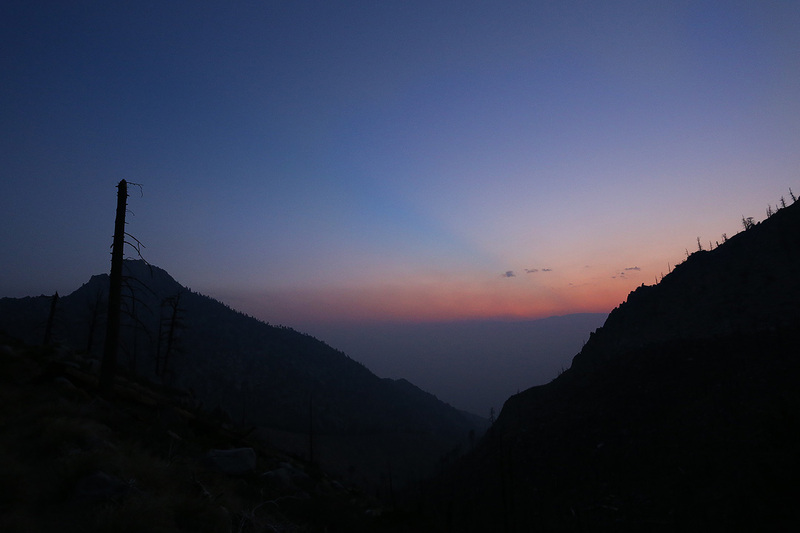 I started my journey the night before, driving up to the trail head with plans to spend the night and get an early morning start. An early morning start is an absolute requirement for these trails. Temperatures on the desert floor can be in excess of 100 degrees, which is no way to start a long, steep and waterless climb into the mountains. I arrived at the trailhead on a dark, moonless night and got out of my car to scope out where the trail started. Right away I started hearing some strange noises that sure sounded like something big walking around a ways off in the desert. It creeped me out a bit, but turned out to only be something flapping around in the wind on the big wilderness sign that I thought marked the beginning of the trail – a mistake, as I found out the following morning. Feeling better and having that settled, I climbed back in my car for a few hours sleep. I woke up to my alarm at 2:45 AM and had what’s lately been my breakfast of champions before a hike – my favorite cinnamon cereal with 3 scoops of Hemp Protein powder and vanilla flavored almond milk. It’s a small, light feeling breakfast, but provides energy for quite some time. I finished that, put on my hiking boots, grabbed my pack which was already good to go from preparations the night before and headed out on what I thought was the trail. Unfortunately, this petered out very quickly, leaving me traveling cross country across the desert floor, weaving around creosote and sage and hopping over rocks. Not an encouraging start to this hike. Thankfully, I had brought my GPS, but initially mixed up two different tracks on there. One was an accurate Google Earth track and one was an approximate topo map track. After some time, I finally figured out which was the right track and used it to gain the trail. Not an auspicious start! Soon, the trail started to steeply climb up the desert hillside at the base of the mountains. It was very dark and I couldn’t make out much of my surroundings, which made for a quiet, meditative climb in the cool air and rhythmic pace I had set, with the only thing in my visual field being the small patch of ground my headlamp was lighting up. The only thing to disturb the mood were coyotes howling off in the distance. Sometimes they would sound close and sometimes far away. I couldn’t help but wonder if it was a couple different packs howling at each other, just like when a bark-fest gets set off between all the dogs in our neighborhood at home. If you have ever heard coyotes howl they can have an eerie sound and feeling to them at times. I think this might have been the first thing that set me off on a bit of a funk. The next thing that did was that it began feeling like I was making zero progress getting out of the desert and into the mountains, despite the amount of hard work already being put into this hike. My legs muscles were already burning and I was feeling a little over exerted for so early on in the hike. It was about this time I also started to realize the smokey smell I noticed back at the car was smoke from a forest fire that blew in during the night. 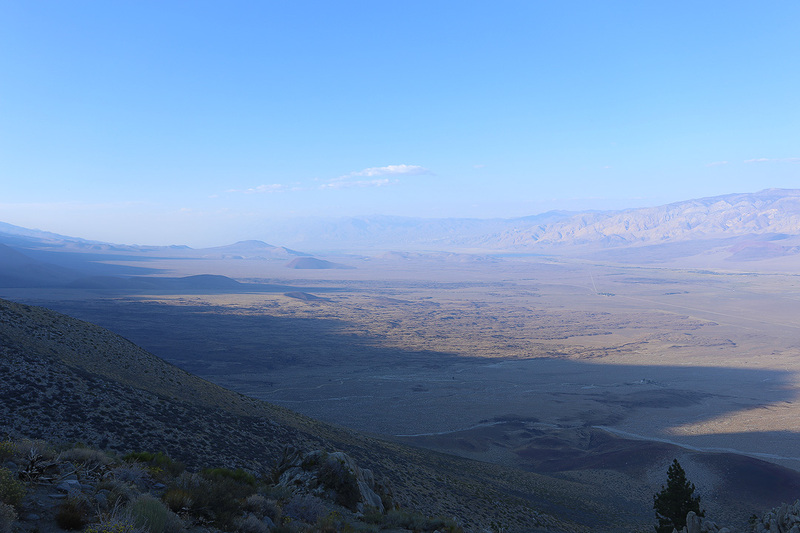 As I got a little higher, I was able to tell Owens Valley was covered in a blanket of smoke. Suddenly, I started to wonder if I should even be working out in this as much as I already had, let alone go in for the long haul to Colosseum Mountain. More to add to my funk! 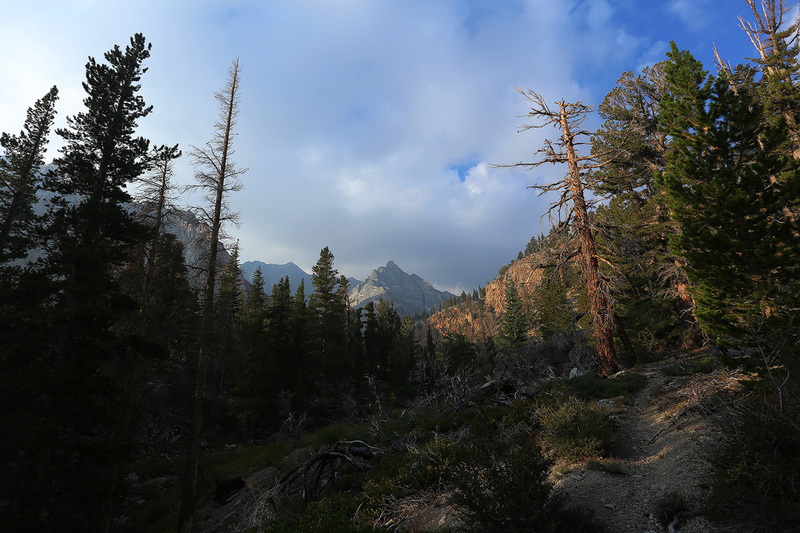 I kept going and finally made it to a section where if feels like one has finally entered the mountains, as the trail rounds a corner and traverses into Sawmill Canyon. The trail drops down a little ways to the stream coming down the canyon. Here, the trail goes through a moderately wooded section and it was very dark in here and bushy in spots. I think because of my funk I already had going, I felt a little vulnerable and nervous hiking through here and a bit more on alert for animals (or, even the boogeyman!) than usual. It was by this time that I started to feel the remote and secluded nature of this trail for the first time and it just seemed like a perfect place to run into some wild life like a mountain lion. On the positive side, I did get a second wind here and felt better hiking up the steep trail. Also, I got the impression that the smoke was clearing some, being the most dense down in the valley. After not too long, I could see the first signs of light from the coming day. The predawn, early morning light greeted me as I slowly climbed out of the wooded area and I felt like the Sun and I were both climbing out of a darkness, one that was filled with all the negative feelings I had on the way up, but all of which were purged by the coming daylight. 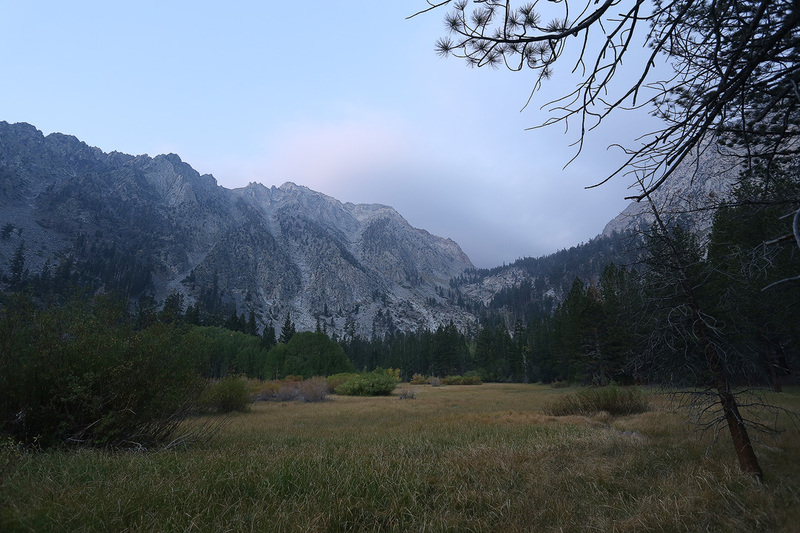 It wasn’t too long from here that I finally made it to one of the minor goals along the way – Sawmill Meadow. The meadow also had a bit of an eerie feel to it, as well, but mainly due to a sky mixed with smoke and some dark clouds. There was a fall color on the ground, with the green being long gone during this very dry year. I was also a bit dismayed by what I saw at the head of the meadow, which was a rather substantial uphill that had to be tackled to get to the next milestone of Sawmill Lake. My second wind was petering out a bit so I had a snack here and slowly headed out towards Sawmill Lake. 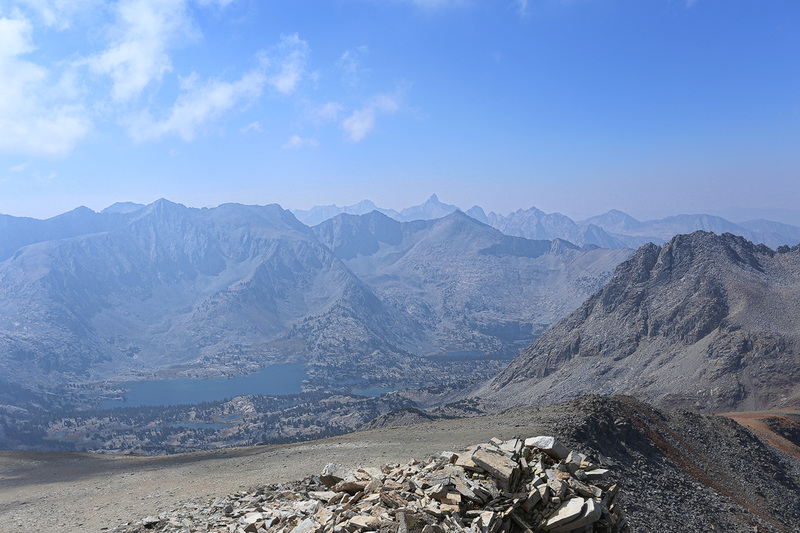 When I got to Sawmill Lake I started to feel like I made some serious progress, as I was now about 7 miles in and had around 5,500 feet of gain out of the way, leaving around 5 miles and some 3000′ of gain to the summit. However, I felt like I was hitting a wall again. Admittedly, I did not go into this hike with the optimum level of fitness I would normally like to have, or should have, and I was definitely feeling it. I started to consider and even become open to the idea that I might only try for the pass, which would make for a great hike in and of itself. I just didn’t see how I was going to make the peak at this point. While thinking about all this, I filtered some water, refilled my water bottles and had another snack. After fueling up and resting for a bit, I started out again for the pass. At first, I thought the pass was at a low point to the left of lake in the background, but it actually headed to what looked like a higher point to the right. The going was a bit steeper and more tiring than it first appeared from the lake. I still felt like I was hitting a wall and one dark corner of my mind was even trying to make me give up on the pass, but no way I was going to give in to that. I trudged on. The pass itself sort of snuck up on me, because next thing I knew I was staring at the big sign at the pass itself and the Sierra Nevada opened up before my eyes out to the West. This whole area on the back of the pass had a remote, wild and pristine feel to it. One advantage to these grueling trails is that one is guaranteed to see few, if any, people in these parts. So far, I had had the entire mountain range to myself, or so it seemed to me, which just added to the ambiance. There were also some moody clouds floating around adding to the scenery. My strategy for the whole day was to just take my time, make sure I never got my heart rate up too high, or my breathing too labored, no matter how slow it meant I had to go. I think this strategy worked out in the end, because I felt a wee bit rejuvenated a few minutes after I got to the pass. With 9 miles and almost 7000′ feet of gain done, I knew I got the majority of the work done for reaching the summit of Colosseum Mountain. But still, Colosseum Col looked far away and the peak was still out of sight and I now I had some trail-less cross country travel plus what promised to be a bit of a loose, steep scramble up Colosseum. But, my newly-found energy and the beautiful landscape beckoned me on. I had to see what what was over there and I didn’t want to give up while I still had something left in me, so I started out again towards the Col, which was my new “baby step” towards reaching the actual peak. I was also relieved to see that the smoke was pretty much gone by now. I really enjoyed this part going across the small valley towards the Col. 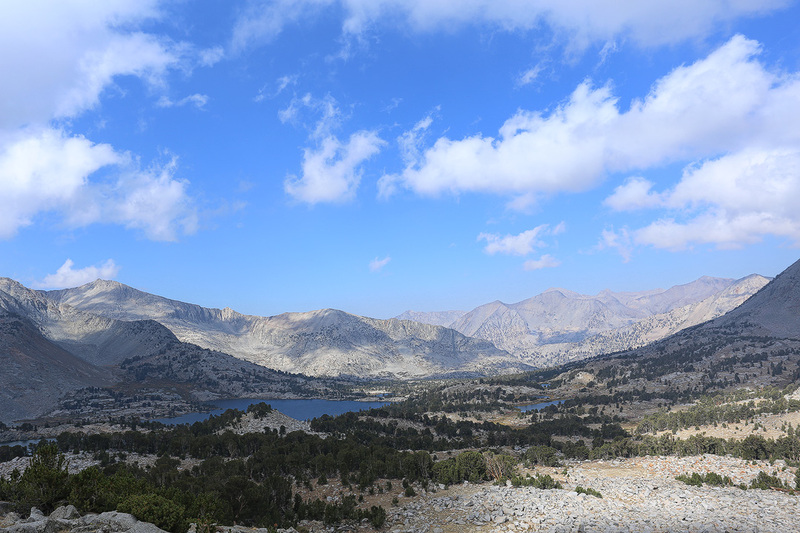 Some views opened up into Woods Lake Basin as the Sierra Nevada stretched out further with some tall, remote peaks towering in the distance. 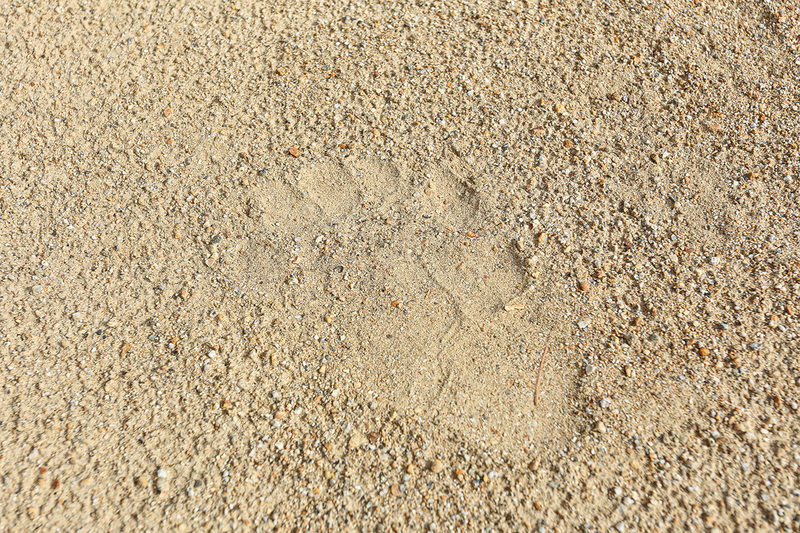 There were many animal prints through here and I came across one bear print that had such interesting and almost human looking toes that I joked with myself about it being a Sasquatch print. After a mile, or so, of weaving around small rock walls and strolling across a few easy meadowy stretches, I reached a small lake near the base of Colosseum Mountain. I refilled my water bottles and refueled one more time. I wasn’t far from the Col at this point, but it looked like a nice amount of boulder hopping to reach it. Meanwhile, the slopes just above the lake didn’t look too bad and there was even a rib that looked like it might offer some Class 2-3 scrambling, thereby avoiding any loose, sandy stuff. So, I made the decision to head up here and it worked out pretty well. It was steep and tiring, but I stuck with my strategy of strictly pacing myself at a speed that didn’t over-exert. Slowly, but surely, I made my way up this steepest part and onto some gentler slopes above that passed one false summit and brought the true summit into view. It was during this part that I saw the only people I encountered the entire day. Two people were over at the Col and starting up Colosseum Mountain shortly after me. I got a bit annoyed, because I really enjoy getting into the moment on these isolated peaks by myself and on my own wavelength. 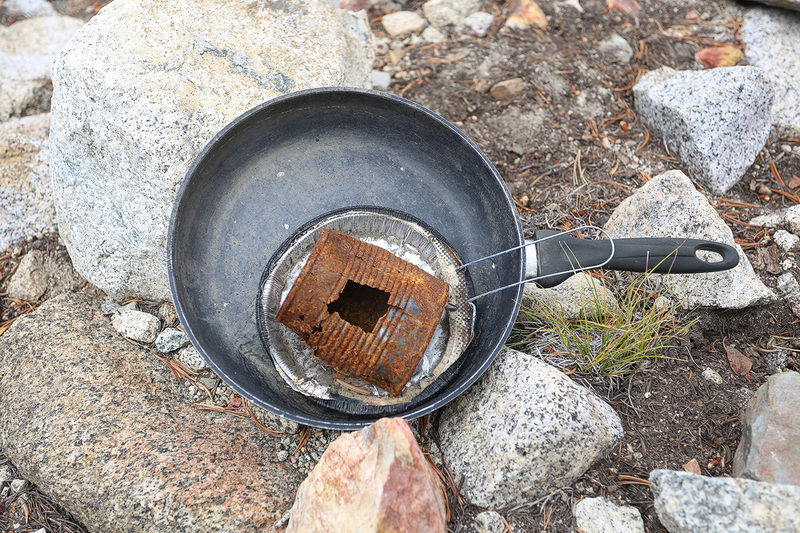 But, it did sound nice to say Hi and see how these guys made there way up here and if they were backpacking, or not. 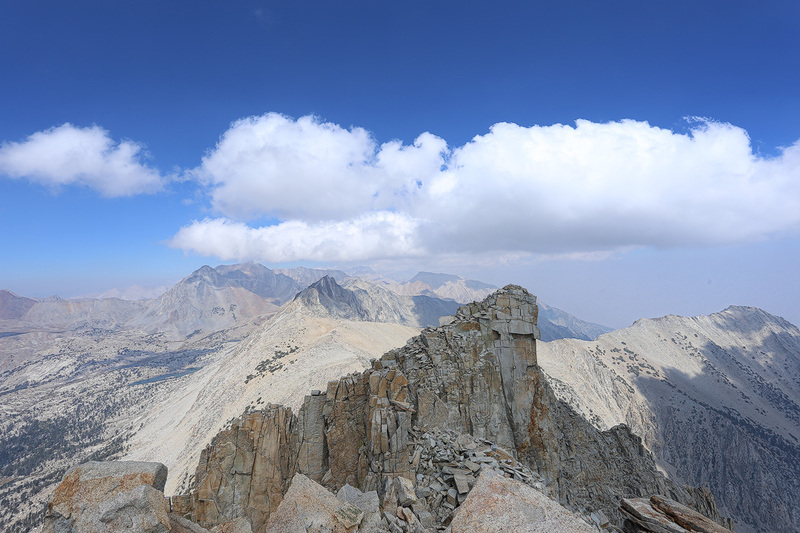 However, it sounds like a lot of people are surprised to find out the Western summit is the higher one, because on your way up, the Eastern summit definitely does look higher. In fact, I still have my doubts about all this. I headed up the Western summit and found the register marking it as the “official” high point, but the Eastern summit still looked higher. In fact, a small tower on the North Ridge even looked a few feet higher. Ah well, I was too tired to care and I know these kinds of things can play tricks with the eye, so I felt satisfied just reaching the one with the register and I wasn’t about to go explore the other spots. Anyhow, either the guys got tricked, or they decided to visit the Eastern one first, giving me my solitude on the summit. Actually, it was only one guy now, as I never did see his partner again. Perhaps, he/she decided to forgo the summit. After signing the register and snapping a few photos, I remembered the pizza that I had brought and became absolutely ravenous for it. That made for one tasty snack! I should have brought a napkin though, because I kept getting tomato sauce on my hands and having to wipe it off on my pants. I was going to make for a nice smelling treat if I ran into that Sasquatch on the way down! I took a few photos and reveled in the views for a bit, while also feeling a bit relieved that the rest was mostly downhill, even if it was roughly 12 miles of it! I started down and got back to that steep part right when my legs suddenly started to feel extremely tired and wobbly. It was looser and more treacherous coming down so I had to go real slow to maintain safe footing and not slip and hurt myself. 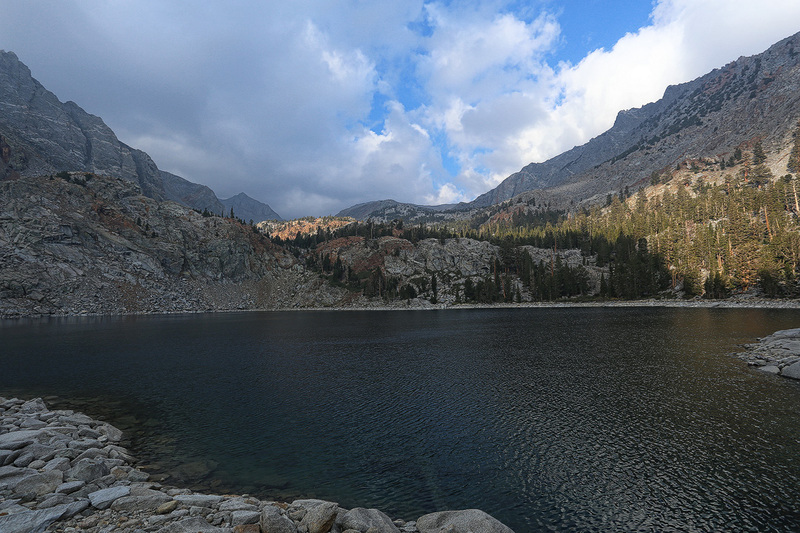 I got back down to the lake and rested one more time before heading back to Sawmill Pass. I made my way through this part enjoying an apple as I walked and soaked in the views. Before getting back to the pass I had about 400′ of gain I had to get out of the way. I started to hit a wall again, but I just went really slow, taking on only like 10-50′ feet of walking at a time, before resting again. It took awhile, but I eventually made it back to the pass. I didn’t stop long because now I was on a mission to get back. I reached Sawmill lake again and then Sawmill Meadow. After descending for what seemed like forever, I was greeted by a rather discouraging view. I could now see down to the valley floor, which looked like a LONG ways down still. My car was down there and off to the left, still out of view. I also was getting low on water, but not wanting to filter again, so I just grabbed some unfiltered out of the stream in my one empty bottle. If I really needed it, I could always filter it out of the bottle later. I kept heading down, my knees doing good, but starting to get sore. 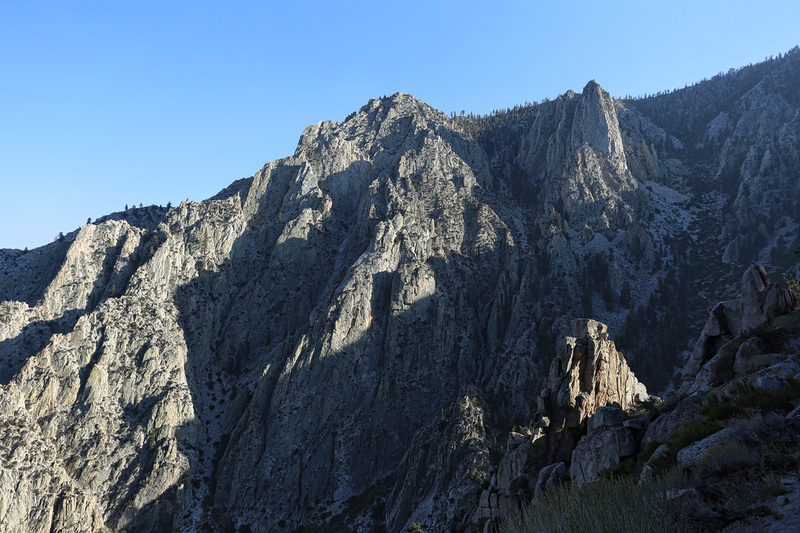 I neared the desert slopes again as I took in the view of the impressive granite cliffs making up the far side of Sawmill canyon down here. Owens Valleys (and my car) Are Still A Long Ways Down! 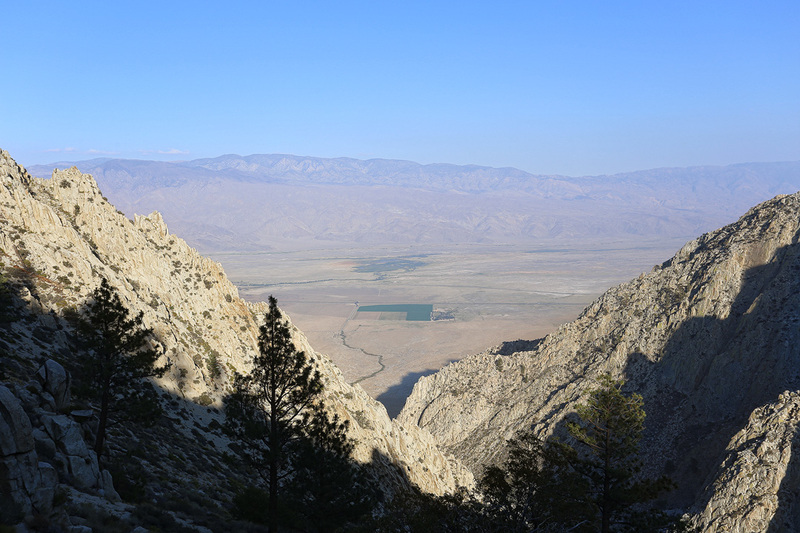 After a few small uphills traversing out of the canyon and back onto what I keep referring to as the desert portion of the climb, I could finally see the part of Owens Valley where I was parked. It looked far away still, being 2-3 miles distant yet. But, the end was in sight! The day was growing late at this point and the Sun was beginning to set behind the mountains. Long shadows of the Sierra were beginning to stretch across the Valley floor and the late afternoon light was giving the landscape before me a golden hue. It was so peaceful. The only sounds were my sandy footsteps and crickets chirping all along the trail. The air was getting cool and the shade felt welcome. Unfortunately, my knees were aching at this point, with every downhill step being quite painful. I just zoned out as much as I could and enjoyed the views without trying to get in too much of a rush to get back. Next thing I knew I was down on the flatter terrain, crossing the last stretch of desert back to my car, which made for a welcome sight. This part was quite a bit easier when you’re on an actual trail too, unlike earlier in the morning! I opened the hatch of my car and grabbed a nice, cold coconut water I had brought for this moment and sat down, feeling fully relaxed and spent. I wasn’t sure if one mountain I was looking at was Colosseum, or not, but it looked really far up there! An adventurous and rewarding day! 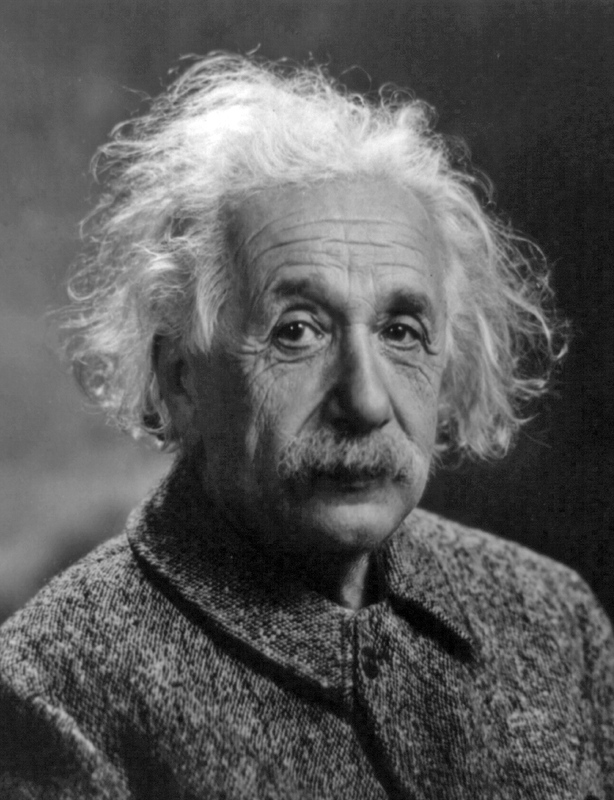 Practically a century ago, Albert Einstein challenged the advent of Quantum Mechanics, perhaps most well-known through the phrase “God does not play dice with the Universe”. 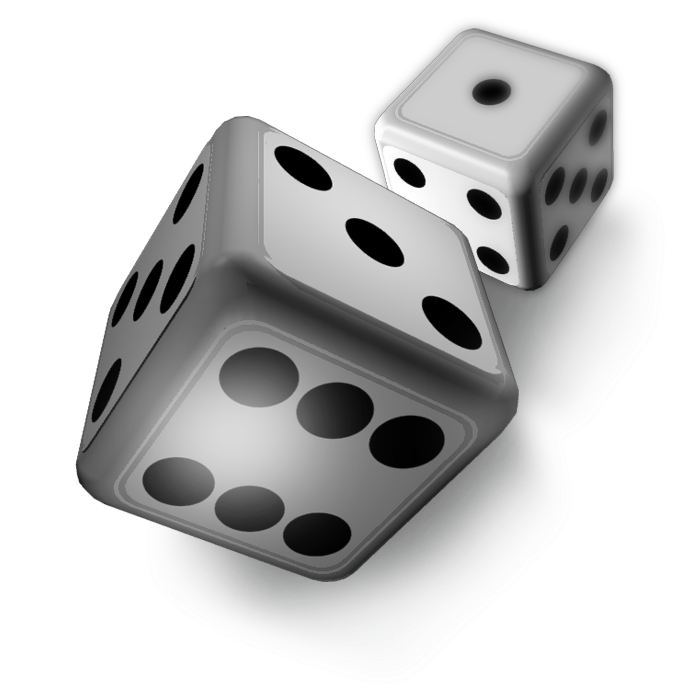 Today I want to provide a short, cursory introduction to my favorite flavor of Quantum Mechanics, which provides an answer to why God might want to play dice with the Universe, as well as provide interesting insight into Free Will. 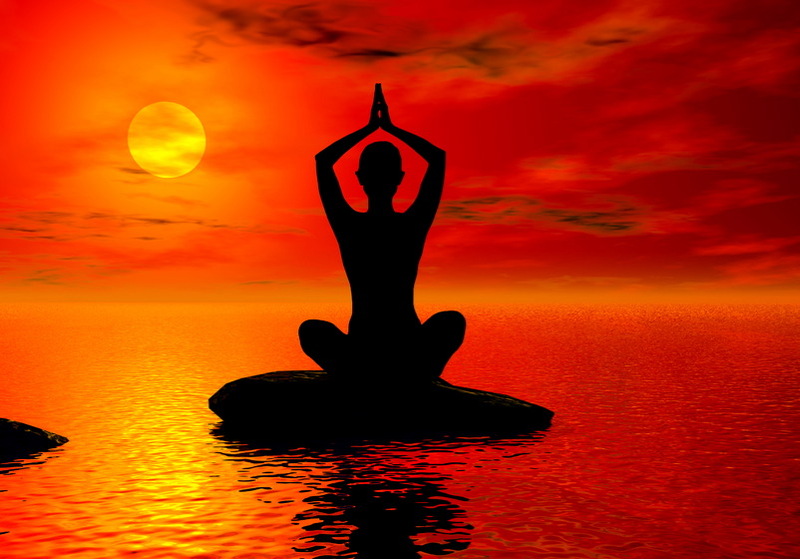 Let’s start by looking at what the two main branches of physics – classical mechanics and quantum mechanics – have to say about the nature of reality. Classical Mechanics consists of the physics (electromagnetism, celestial mechanics, etc) which describe the macroscopic world. One key characteristic of the physical laws in this domain is that they are deterministic in nature. Given a set of initial conditions, one can predict future trajectories. In addition, objects are considered to have precise historical trajectories. The classic example is billiard balls. Given some initial force by the que stick in a given direction, one can determine exactly where those balls will end up. The billiard balls also had precise historical trajectories along the way, in that they followed a definite path at a definite speed across the pool table. So, what does this say about free will? If we are just large collections of molecules, which were set in motion at the beginning of the Universe (amongst many, many other molecules), we’re all just like those billiard balls bouncing around. All our actions and thoughts are pre-determined by the initial conditions of the Universe, which leaves zero room for Free Will. Not looking promising so far, but let’s move on to Quantum Theory. Quantum Mechanics (QM) is an altogether different story and a very exotic place. A simple example is a quantum particle which has only two spin states – spin-up and spin-down. (Spin is equivalent to a top spinning, or even the Earth rotating, but in QM spin states are quantized, or restricted, to certain values) Classically, one would expect the physics to be able to predict whether one would get spin-up or spin-down upon measurement. Instead, QM says the best one can do, even in principle, is predict the probability of what one will get upon measurement. For a physicist who is used to being able to precisely predict outcomes, this can be a bit disconcerting, which is partly why Einstein said “God does not play dice with the Universe”. 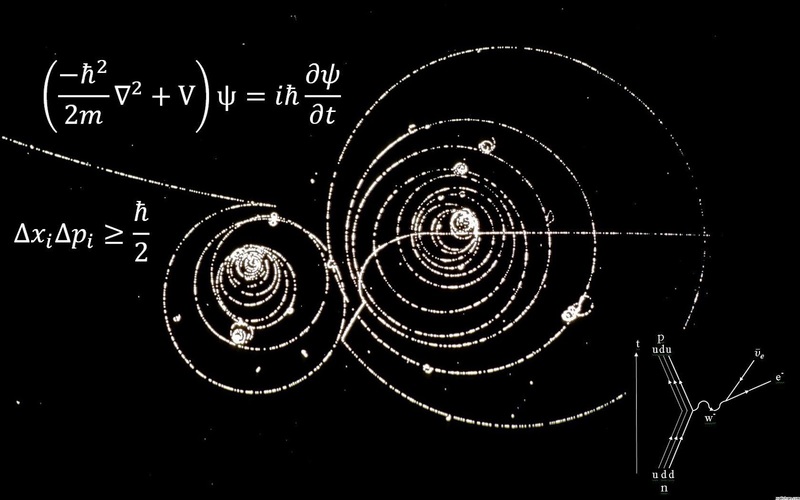 Perhaps even more troubling than the probabilistic nature of the predictions is that before measurement the particles are considered to be in a superposition of spin-up and spin-down, which would seem insane in the classical world. This applies even to the particles position, meaning they do not have well-defined historical trajectories. As unfounded and strange as this all sounds, it is well verified over the past century via experiment. So, what does this say about free will? QM still presents us with an undesirable picture for free will. Here, we have a set of potential outcomes where multiple actions, or thoughts, might be possible, but they are completely left up to chance. Whether you got the bacon crisp or avocado burger for lunch was not your choice, but rather left up to the “flip of a coin”, perhaps in your neurons. This probabilistic nature of Quantum Mechanics has been an area of great debate and intense study for the past century. Why would reality take on such a bizarre nature? Anyhow, this is how it would all seem … so far. This is what the two big pictures in physics seem to say about the nature of reality at first glance. Let’s take a look at Time Symmetric Quantum Mechanics (TSQM) and see how things change. Both areas of physics above assume that time is solely linear, flowing from past to present to future. If A happens before B and B happens before C, then what happens at A can effect B and C, and what happens at B can effect C. But, what happens at C will never effect what happens at B and A, and what happens at B will never effect what happens at A. This is cause and effect as we normally view things. TSQM mixes things up a bit, but in very subtle ways. Standard quantum mechanics has a wave function (the mathematical object that encodes the above mentioned probabilistic outcomes) that propagates forward in time (from A to B to C). TSQM consists of two wave functions – one propagates forward in time to the present and the other propagates from the future to the present. In other words, the outcome from a measurement obtained in the present (say, at B) depends upon information from the past (what happened at A) and the future (what will happen at C). (I would like to stress this is a very subtle type of retrocausality that in no way violates our everyday notions of cause and effect. I will get a bit more into this below). Modern experiments seem to suggest that what happens at C, can indeed effect measurement at B. See the reference links provided below. Yakir Aharonov is one of the founders of TSQM and the insights this formulation contains. 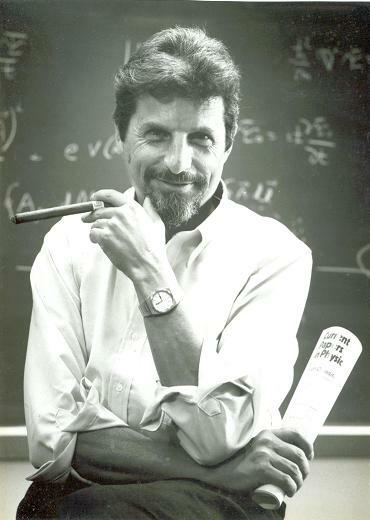 In fact, Aharonov decided to mix things up and instead of making a claim like, “God does not play dice”, he decided to ask a question. What advantage would there be for God to play dice? Is there something we are perhaps missing, that could make us realize there is a deeper reason why nature would at first appear probabilistic. As it turns out, TSQM suggests there is indeed a larger picture we are missing here. The first two we are well familiar with and, for the most, take for granted. The third is introduced by TSQM. At first glance, all three seem to be mutually exclusive to each other. 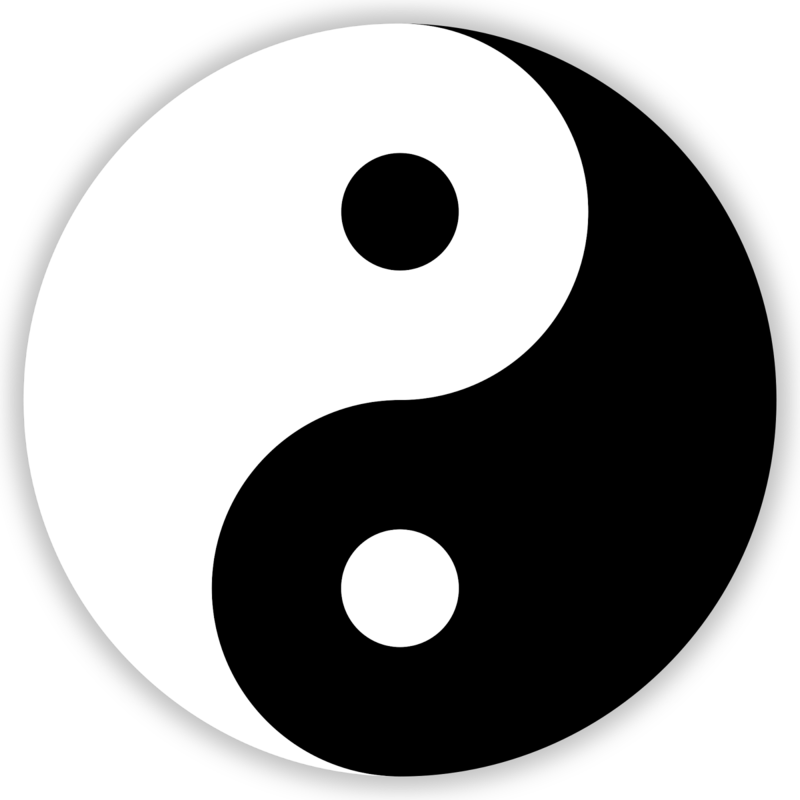 Free will seems to be prohibited by classical and quantum theory, as discussed above. All your choices are determined, or effected by a preceding physical cause, meaning they can never be truly free (and QM alone didn’t offer much help here). Retrocausality seems to contradict both. How can one have retrocausality without violating our normal notions of cause and effect? And, if there is a “destiny” out there waiting for us (let alone reaching back in time to effect the present), how can we have free will, or choose our own destiny? It turns out the “rolling of dice”, or the probabilistic nature of Quantum Mechanics, is exactly what one needs to allow those three principles to live together! To set Einstein straight, this is why God plays dice! When taken in a larger context of a reality which allows a richer structure for spacetime, a seemingly bizarre and perhaps undesirable facet of reality suddenly becomes not only enlightening, but useful beyond our wildest imagination. Not only that, the probabilistic nature of the reality at the quantum scale seems to indirectly imply free will, even if at first glance it appears to be a stumbling block to it. In addition, for the three above-mentioned principles to exist harmoniously it would appear we need a richer view of time than our normal linear time, specifically one that allows for the type of retrocausal influence found within TSQM. That these three can harmoniously exist within the framework of TSQM has been shown by physicists working in the field, although a comprehensive paper outlining the specifics is still waiting to be published. I’ll try to quickly cover some of the basics of how this works and will dig into it more in a future blog post. Of course, this will be stated in terms of a scientist having free will, or free choice, over what he does and does not measure. 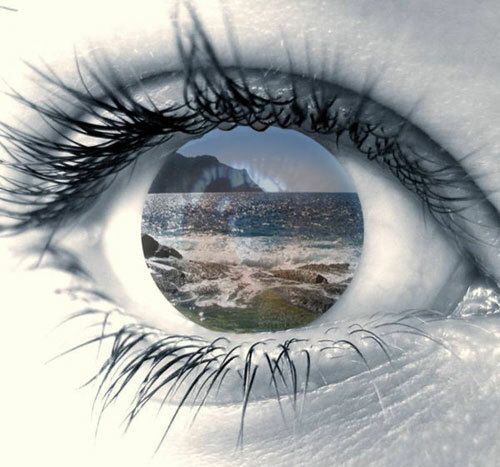 In a subtle fashion, Mother Nature protects free will choice from “destiny”, by making it so one can never be sure if what they observe in the present is really a wave function (i.e. “destiny”) propagating back in time or just error in the measurement process, which is a ramification of the type of measurement used within TSQM – weak measurements. No matter what way they have come at this problem, they cannot get around it. It is only by examining all the measurements (past-present-future) after the fact, that one is able to decipher what really happened. In this way, free choice in the present, as to what measurements one can take, are protected from these subtle retrocausal influences. Further, it has been shown that it is precisely the probabilistic nature of QM that is needed in order for (1) free will, (2) cause and effect, and (3) a subtle retrocausality, to all exist harmoniously. As you may already know, I also explore parapsychology on this blog, so I can’t help but point out that this is the kind of direction physics needs to head in to accommodate a phenomenon like psi. One type of psi experiment shows that folks seem to react (on an unconscious level) to certain stimuli 1-10 seconds before the stimuli actually happens. This is screaming for a richer view of reality, like the one presented in TSQM, which does allow information from the future to leak into the past. TSQM doesn’t yet provide a mechanism for psi, but it does begin to open up a new window to reality that at least seems conducive to the existence of psi. I would imagine this blog post has raised a number of questions, even if potentially providing a number of fascinating answers to some other questions. I hope to cover more in future posts I am planning to write about TSQM. Stay tuned!